Sachiko is a stylist that I often work with for my prewedding shoots in Toyama. She was also my stylist for my own wedding party in Japan. I was of course really thrilled when asked to cover her wedding. 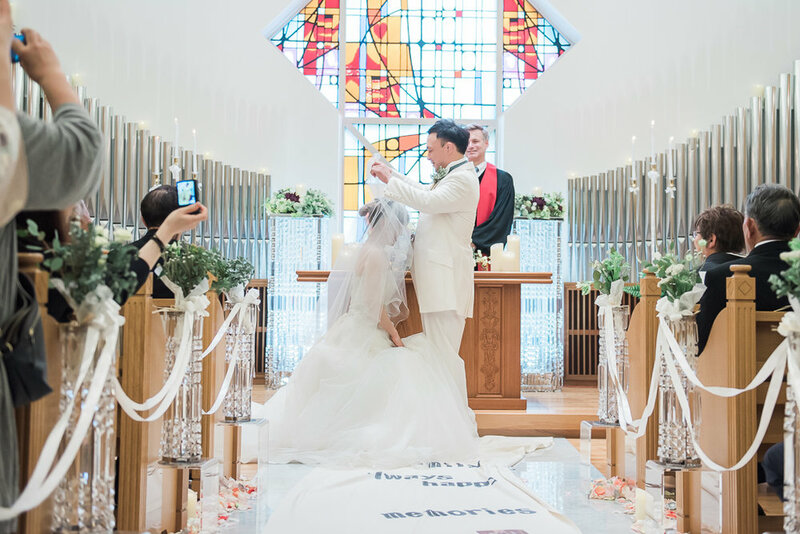 Sachiko & Youhei's wedding was held in a hotel and the couple added their personal touches to it. Sachiko spent weeks making a aisle runner as a surprise for Youhei. It had picture of Youhei's pictures from childhood to adult, days of their courtship. Such a beautiful idea to help relive memories as the couple walk down the aisle. The bridal room was bustling with laughter and chatter with Sachiko's stylists friends helping the couple prepare for their big day. There were glowing and moving speeches for the couple, magic shows for the guests, just lots of fun. It was a beautiful celebration with the perfect combination of smiles and tears. This is Youhei and Sachiko's wedding story.